ඔප්රා වින්ෆ්‍රේ (උපතේ දී ඔර්පා ගේයිල් වින්ෆ්‍රේ Orpah Gail Winfrey; ජනවාරි 29, 1954) ඇමෙරිකානු මාධ්‍ය හිමිකාරිනියක, රූපවාහිනී සංවාද වැඩසටහන් මෙහෙයවන්නියක, නිළියක, නිෂ්පාදකවරියක සහ මානව හිතවාදිනියක වෙයි. ඇගේ දි ඔප්රා වින්ෆ්‍රේ ෂෝ නමැති රූපවාහිනී සංවාද වැඩසටහන නිසා ඇය අතිමහත් ජනප්‍රියත්වයකට පත් වූවාය. 1986 සිට 2011 දක්වා විකාශය වූ එම වැඩසටහන, එම වර්ගයේ රූපවාහිනී වැඩසටහන් වලින් වැඩිම ප්‍රේක්ෂක ප්‍රසාදය දිනා ගත් වැඩසටහනයි. සියළු මාධ්‍යයන්හි රැජින ලෙස අන්වර්ථ ගන්වන ඇය වැඩිම වත්කම් හිමි අප්‍රිකානු-ඇමෙරිකානු පුරවැසියා සහ ඇමෙරිකානු ඉතිහාසයේ ප්‍රථම කළු ජාතික මල්ටි-බිලියනයර් ද වෙයි. ඇගයුම් වාර්තා කිහිපයක් මගින් ම ඇය ලොව වඩාත් බලගතුම (Influential) කාන්තාව ලෙස හඳුන්වා ඇත. ↑ Winfrey has said in interviews that "my name had been chosen from the Bible. My Aunt Ida had chosen the name, but nobody really knew how to spell it, so it went down as "Orpah" on my birth certificate, but people didn't know how to pronounce it, so they put the "P" before the "R" in every place else other than the birth certificate. On the birth certificate it is Orpah, but then it got translated to Oprah, so here we are." "Oprah Winfrey Interview". Academy of Achievement. January 21, 1991. Archived from the original on January 19, 2016. සම්ප්‍රවේශය August 25, 2008. ↑ "Oprah Winfrey". IMDb. සම්ප්‍රවේශය March 28, 2015. ↑ "The World's Most Powerful Celebrities List". Forbes. සම්ප්‍රවේශය May 21, 2013. 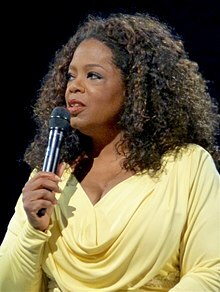 ↑ "#184 Oprah Winfrey". Forbes. සම්ප්‍රවේශය May 10, 2017. ↑ "Oprah Winfrey in Melbourne for Australian tour 2015 spreads a message of love, reveals lost child". News.com.au. සම්ප්‍රවේශය September 25, 2017. මේ පිටුව අන්තිමට සැකසුවේ 28 මාර්තු 2018 දින දී, 03:45 වේලාවෙහිදීය.